Occasionally, an expensive and unattainable technology will mature to the point that something previously esoteric, distant and impenetrable becomes warm, cuddly, and practical. Numerous examples exist if you look for them. Take the Korg MS20, which first appeared in 1978. Its beguiling patchbay and external signal processor may have promised far more than they delivered, but the instrument nonetheless signalled a new maturity and accessibility for modular synthesis, placing it in the grasping hands of impoverished students, myself among them. Another prime example appeared three years later when Korg launched the 'Poor Man's Prophet 5', the Polysix. Sure, there was nothing particularly radical in this, but it was a 'real' polysynth as opposed to a paraphonic string synthesizer on steroids, and it sounded superb. It showed that polyphonic synthesis had matured, and placed it for the first time in the grasping hands of impoverished musicians, myself among them. 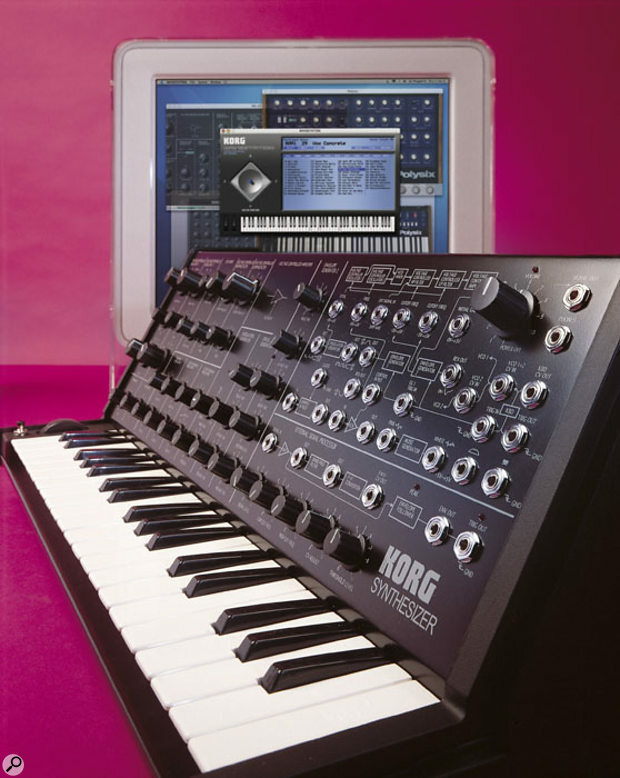 In 1988, Korg did it again, employing Yamaha's VLSI and surfacemount techniques to combine sample+synthesis technology with digital multi-effects units and 16-track MIDI sequencing. The result was the M1, the instrument that signalled the maturity of the digital synth, and established the form of the modern keyboard workstation. The company repeated the trick two years later when it released the Wavestation. With its greatly improved vector synthesis and wave sequencing, this gave everyone access to the expensive, 'produced' sounds that were once the preserve of million-dollar studios. Since the late '90s, everything has become smaller, lighter, faster, cheaper, and more powerful, and advances in computer technology have started to reap a tangible benefit, because the fledgling technology of software synthesizers has been improving rapidly of late. But, as yet, there has been no software synth that has made me want to jump up and down and shout "gimme! gimme! gimme!" as did the first MS20s, Polysixes, M1s and Wavestations, all those years ago. But today there's a product that threatens to signal the maturity of the software synth, both in terms of sexiness and capability. It's not a matter of pricing; software synths have never been particularly expensive. It's to do with the desirability and usability of the product. And, in a weird twist of fate, it's a recreation of the Korg MS20, a reincarnation of the Korg Polysix, and a reinvention of the Wavestation. There's even a bit of the M1 philosophy tucked away inside it. Is it a bird? Is it a plane? No... it's Korg's Legacy Collection. Don't you just love the English language? It has words such as 'cute' and 'unbearably' which, when combined correctly, let me tell you that the MS20 hardware controller is almost unbearably cute. Unfortunately, it's also very specific in its role as an MS20 hardware controller. Sure, you can plug it into the host computer using a USB cable, and use its velocity-sensitive mini-keyboard to play the Wavestation. But while the mod wheel will carry out its appropriate task, none of the knobs or patch-points are active, not even the master volume control. So we'll say no more about it until next month. Even before its release, the Legacy Collection generated a significant amount of interest. My expectations prior to trying it out were therefore very high. This is why I was so surprised to find that there appeared to be no single philosophy underlying the product. There are five components in the Legacy Collection: three independent software synths (the MS20, Polysix and the Wavestation), a 'Combination' module called Legacy Cell that links the MS20 and Polysix (but not the Wavestation) and a hardware controller modelled on the original MS20. Now, if Legacy Cell supported the Wavestation, everything would feel more integrated. Likewise, if the hardware controller were not so obviously designed to support the MS20 software, everything would feel more coherent. If Korg Native mode (which we'll come to next month) worked across the whole package, everything would feel more like a single product. But they don't, and it doesn't. If I had to guess — which I do, because I have no inside information one way or the other — I would say that the Legacy Collection might be two disparate development projects that happened to come to fruition simultaneously, and which the top brass at Korg decided to combine into a single product. I can think of no other explanation for the fact that the Wavestation software (a product of Korg USA) and the MS20/Polysix/Legacy Cell/MS20 controller (products of Korg Japan) are so completely un-integrated. Nevertheless, in a clouds and linings sort of way, this has a benefit for me — I can treat the American and Japanese components as independent products. So in this, the first part of my Legacy review, I'm going to concentrate on the Wavestation alone, leaving the other components until later. The soft elements of the Legacy Collection come in a single box that contains a CD-ROM and four manuals. These further emphasise the independence of the products because, as well as the Installation and MS20 Controller manuals, there's one for the MS20/Polysix/Legacy Cell, and another for the Wavestation. Installation from CD-ROM is painless, but when it's complete, you must obtain a licence code over the Internet. This procedure also gives you access to the registered users' download area, which allows you re-register the software if you change computer. If you choose not to register right away, you'll be able to use the software for 10 days, but after that time the plug-ins will fail to load. I know, because I waited. Once the software is installed, you'll need to set up the I/O parameters for each of the three synths. Obviously, many of the settings will be dependent upon the MIDI devices connected to your computer, your audio input and output options and so on, but this is also where you determine parameters such as clock source, word length, buffer size and latency. As with any other software synth, get these wrong and things may go wobbly. I found that if I reduced the audio latency from its default setting of 5.8ms to the minimum of 0.73ms, I obtained a quiet but unpleasant buzz from my Mac itself (thankfully, this was not present on the audio outputs). Although operation appeared stable, I didn't like this, so I increased the latency until the buzz disappeared, which it did at... 5.8ms! This is an acceptable figure (about one hundredth of a beat at 120bpm) but means that the Legacy Collection will not be my studio's most responsive sound source. Developed by the former Sequential Circuits engineering team and released in 1990, the 61-note Wavestation keyboard used PCM samples as the basis of its sounds. However, unlike conventional digital synths and workstations, it had the ability to layer PCMs within patches, to chain them together, and to 'morph' smoothly between them. You could even layer up to eight patches simultaneously. With a wave sequence, a pad, and a couple of lead sounds playing simultaneously, the Wavestation was capable of producing what sounded like complete tracks, even without a sequencer. However, the original Wavestation lacked piano and drum PCMs so, in 1991, Korg bowed to the inevitable and added them. With a handful of new effects thrown in for good measure, the expanded 'EX' version was otherwise identical to the original. Despite numerous calls to produce a 76-note version, Korg never did so. In contrast, their next offering was the Wavestation A/D, a 2U rackmount version of the EX with a larger memory and a pair of analogue inputs. These made the A/D a powerful vocoder, as well as an unusual signal processor. The final version appeared in 1992. This was the Wavestation SR, a 1U rackmount with a tiny screen. This meant that you had to use a computer-based editor to get inside it, and few players bothered. Korg balanced this with a huge increase in patch memory. The whole hardware family was discontinued in the mid-1990s. Like Paul White, who previewed the Collection in last month's SOS, I am a huge fan of Wavestations. There's a simple reason for this... the things sound glorious. From the lushest pads, to magical, evolving timbral sequences, to rich imitations of orchestral instruments, to screaming leads and tortured guitars, the Wavestation is king. This is why, like Paul, I'm well-placed to compare the Legacy Wavestation to the originals: within reach of my right hand as I type this, I have a Wavestation A/D rackmount module, while behind me is the Wavestation EX that I'm using as the controller for both the A/D and Legacy. However, despite our love for these beasties, there is one thing that nobody cherishes about them. This is the operating system, which hides the synth's sonic glories behind more than 40 impenetrable and wholly inadequate screens. The Legacy Wavestation's Performance Select page. When you switch on, the synth presents you with the Performance Select screen, which allows you to select a sound, or press one of five 'soft' buttons to enter the Bank Select, Performance Edit, MIDI, Global, and View Performance List sections, respectively. The sixth button makes the A/D play the current sound on middle 'C', just to check that everything is hooked up and working. So far so good, but a Wavestation Performance comprises up to eight 'Parts' which each comprise a 'Patch' plus additional parameters that determined how the Patch responds within each Part in the Performance. Got that? 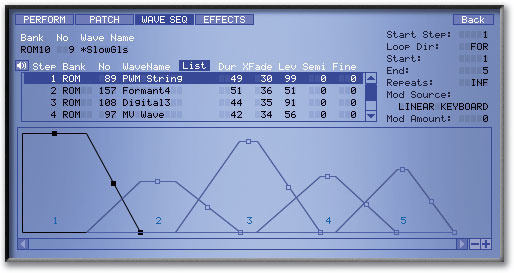 To access the Parts on an original Wavestation, you press the Edit button, and the screen then displays the Patches used, and offers six further options; Detail, Patch, Solo, Name, Effect, and Write. Burrowing still deeper, the Patch button takes you to a page that lets you determine how many oscillators are used in that Patch, and which offers six further options... and so it goes on. Now, imagine trying to construct a Performance comprising, say, five Parts, each of which uses a different Patch comprising four oscillators, each with its own detailed set of parameters. In principle, it's horrendous. On a 40-character, six-line screen, it's 100 times worse. As for the SR, with its two-line screen... don't even think about it! But that's still far from the end of the story, because the next step down the hierarchical ladder enters the Wave Sequencing page and the Wave Mix Envelope (Vector Synthesis) pages, which themselves offered further tiers of options and pages beneath. 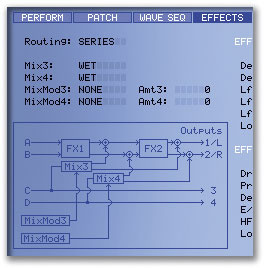 As a result, Wavestations are not synths that many people program for fun, and few players have scratched much below the surface. So, given that the sound is superlative, how can the software synth improve upon the originals? The answer, obviously, lies in the user interface. To invoke the stand-alone incarnation, you double-click on the program wherever it exists on your Mac/PC, and the single, non-scalable Wavestation screen appears. As with its hardware ancestors, this boots up into its Performance Select page (shown on the previous page) but this is much more informative than before, showing all 50 Performances available in the current Bank. It also offers access to every other Bank (there are 11 in all) at the click of a button. This alone replaces many of the original Wavestations' pages and saves the endless scrolling through hundreds of Performances that you have to go through on the Wavestation SR. You select a new Performance by clicking on its name in the lower window, or by clicking on the Performance number in the upper window and dragging it up or down. Once selected, you can play a Performance immediately, or you can use the Preview button to play one of five preset phrases for auditioning purposes. A huge improvement, right from the start. How Do You Run Yours? You can run the Wavestation as a stand-alone program supporting Core Audio interfaces and the Mac's own sound I/O system, or as a VSTi/Audio Units plug-in. You can even run each version of the program simultaneously, although this will place a high burden on any processor. I'm very impressed with this degree of flexibility, and the fact that all the options worked perfectly, straight out of the box. Double-clicking on a Performance name in the lower window has the same effect as clicking on the Edit button in the upper window, and takes you to the Performance Edit page (shown above). As before, this replaces umpteen pages in the original Wavestations' operating systems, including Performance Edit, Part Detail (1 to 8), and the Key and Velocity Zones page. Nonetheless, the philosophy is the same and, as on the originals, this is where you insert Patches into Parts and determine how each contributes to the Performance. Clicking on the little 'speaker' icons to the left of the screen mutes and solos the Parts, which is vital when you come to edit individual sounds within the Performance. Happily, editing the Parts is not just simple when compared to the original Wavestation, it's simple, full stop. For example, you can assign a Patch to a Part just by dragging the Patch number up or down or, if you prefer, by clicking on the 'List' button and selecting from a list that appears superimposed over the joystick on the left of the screen. Clicking on a Part brings up the relevant values for each of the parameters in the Details and Zones sections of the window, such as the Part level, its transposition and fine-tuning, its response to Note On messages, its temperament, and how it's routed to the effects busses. You edit these by clicking and dragging, by typing in new values, by clicking through a range of settings, or by selecting from drop-down menus, as appropriate for each parameter. Best of all, you can determine the key and velocity zones for each Part simply by dragging the appropriate end of the bar in each display. 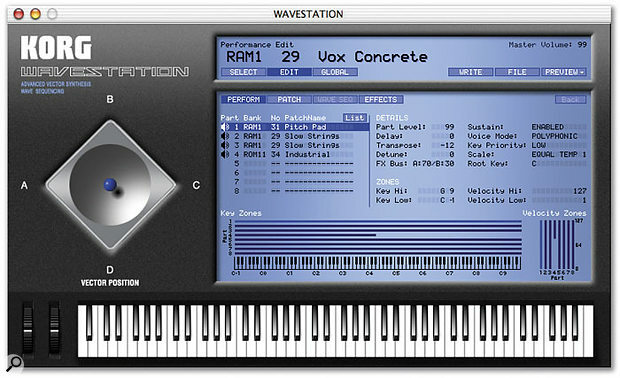 Suddenly, the Wavestation becomes quick, easy and intuitive to program. I love it! Clicking on the Patch button or double-clicking on an individual patch name takes you down a further level into the Patch Edit pages, which is where the real nuts and bolts of the Wavestation 's synthesis lie. Patch editing on the Legacy Wavestation. As on the originals, each Patch can comprise one, two or four oscillators, with or without hard sync of oscillators B, C and D to oscillator A. Each oscillator has an independent pitch section with a dedicated pitch envelope, a filter, an amplifier with a dedicated four-stage envelope, a panning section, a freely assignable four-stage envelope, and two assignable LFOs. What's more, almost everything can be modulated (usually twice) by a wide range of sources including velocity, aftertouch, and two assignable MIDI sources. If you were to lay out all four oscillators in each of the eight Parts on a sensibly proportioned, physical control panel, I fear that it would approach the size of a squash court, but the Legacy Wavestation reduces this to something considerably smaller that nevertheless remains clear and remarkably intuitive (see above screenshot). 'Macros' are another unusual facility in the Legacy Wavestation. These are predetermined sets of pitch, filter, amplifier and panning parameters that apply specific, appropriate characteristics to your sounds (such as piano, organ, brass, strings, and so on) without you having to program numerous values. The natures of the Macros differ on each of the pages, but offer configurations appropriate to each. Of course, you are not limited to using the factory Macros, and as soon as you start to edit these elements of the sound, the Macro name changes to 'User', and the parameters are handled in the normal fashion. 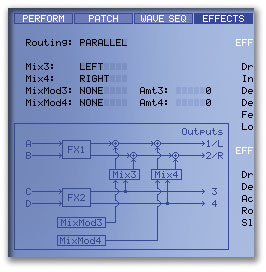 The amount of sound contributed by each oscillator in a Patch is variable according to a two-dimensional Mix Envelope. This is much like dynamic automation of a mixer, except that the total contribution is always 100 percent, whether this is delivered by a single oscillator, by two, or by four. You control the relative mix using 'Mixenv' (as the envelope is called) to determine how much each oscillator contributes at each of five points in time. You can also decide whether the envelope will loop, and between which of these points. To illustrate this, I have created a four-oscillator patch and fashioned the simple Mix Envelope. As you can see, the sound starts at Point 0 with the whole contribution coming from oscillator 'D', which has the wave *WSTouch inserted. The sound then travels along the line (more properly called a 'vector'... hence the name 'Vector Synthesis') from Point 0 to Point 1, at which time all the sound is being generated by oscillator 'A', which is *DeepWav. Next, the sound passes to Points 2 and 3, with the sound morphing to *Quarks and then *ResXwav before, at Point 4, it moves to the centre of the diagram, at which time the output is an equal mix of all four oscillators. I have also set a Loop, so that — if I hold the key indefinitely — the sound loops repeatedly from Point 2 to Point 3. As it happens, this choice of waves and loop is rather poor and results in a discontinuous sound. No matter, I could have made a better choice of waves, and there are other options that let you morph more smoothly from one sound to another. As you might expect from a synth of this complexity, this is isn't the end of the matter, because the Legacy Wavestation also allows you to modulate your position independently on both axes of the Mix Envelope using your choice of two modulators from a list of 13 sources. This means that, in addition to travelling around and looping within the mix path, the sound can be modulated between oscillators A and C and oscillators B and D in all manner of hideously complex ways. This is the source of the Wavestation's ability to create evolving pads that are, in my view, unequalled by any synth before or since. And so we reach the deepest level in the Wavestation, the Waves themselves. But lest you think that there's little to discuss here, I must remind you that a Wave need not be just a single waveform sucked from the ROM, it can be as many as 255 waveforms joined together, crossfaded, looped, and generally manipulated in an operation called Wave Sequencing. This is not unique to the Wavestation. However, by allowing you to determine the duration and level of each Wave in a wave sequence, where the playback starts, the direction, how the sequence loops, how each stage crossfades to the next, how the sequence responds to modulation and controllers, and more, the Wavestation developed the idea far beyond anything else available in its day. Creating wave sequences on the graphical display. Strangely, creating a wave sequence on the original Wavestation was not as hard as you might imagine. A single page allowed you to select each Wave, its tuning, its level, its duration, the crossfade duration, the start point for a loop, the end point, and number of repeats. Nonetheless, the graphical display employed by the Legacy Wavestation is a huge step forward. You can select Waves within the sequence and determine their parameters numerically, just as on the original Wavestation, but it's much simpler to list all the waves available, clicking on each to hear what you might be entering into the sequence, and then inserting the Wave as a new stage, or overwriting an existing one. Next, each stage in the resulting graphic has 'handles' that let you adjust the duration, level and crossfade time of the Waves. If you want to delete a wave, you just hold down the Ctrl key and click on it, and then select the Delete option from the pop-up menu that appears. It's elegant, it's simple, and it works beautifully. In series.The final element in the Wavestation 'engine' is its effects system. This comprises two stereo multi-effects units, Effect 1 (FX1) and Effect 2 (FX2). You can configure these in two ways, in parallel and series (helpfully, the routings are displayed graphically, as you can see from the screenshots on the next page). You can use the 'FX Bus' settings in each of the Parts and the Pan settings in the Patches themselves to route the signals to the four effects busses. These busses are confusingly named A, B, C and D, but you must not confuse them with the A, B, C and D Waves within a Patch. The names are the same, but they are very different entities. It would take more room than I have available here to describe the operation of the effects busses in detail, let alone each of the 55 effects offered, but the system is flexible enough that I was able to set up test configurations where, for example, a stereo chorus was placed in series before a 'live stage' reverb across busses A and B, while Busses C and D passed directly to the outputs. I also tried a parallel setup where busses A and B passed through a stereo multi-tap delay, while busses C and D passed through a rotary speaker effect (this configuration would be useful if you wanted to process two sounds — say, a guitar and a Hammond organ patch — with different treatments). Placing the effects processors in series (above), and in parallel (shown here).While this proved straightforward, the two mixers provided in each configuration make matters considerably more elaborate. Called Mix3 and Mix4, these allow you to feed a proportion of C and D into the A and B busses, either before FX2 or after FX2, depending upon whether the Series or Parallel configuration is selected, and how the mix parameters are set. The amount and panning of each Mix can be modulated, and drop-down menus offer 14 mod sources, including the assignable MIDI controllers. One further complication here wasn't present on the hardware Wavestations. When running the Legacy Wavestation as a stand-alone module, outputs 3 and 4 do not exist and all four busses are routed to the 1/L and 2/R outputs. If you load the software as a plug-in, outputs 3 and 4 are available, and remain independent of 1/L and 2/R. Although they're part of the Effects section, I can't omit mention of the Wavestation's vocoders. These six algorithms were introduced on the Wavestation EX, but only achieved their true potential on the A/D, whose very name was defined by the dual analogue-to-digital converters that allowed you to process external audio signals and use the synth as a vocoder. Unfortunately, the Legacy Wavestation has no signal inputs, so you can only use the vocoding algorithms to affect internal sounds, as on the EX and SR hardware models. Given that you can use multiple Parts to construct a carrier, and multiple Parts to construct a modulator, the possibilities are still enormous, but the loss of the external inputs means that the vocoders' usefulness has been curtailed, which is a great shame. To be honest, this seems wholly unnecessary. I can't imagine that it's beyond the ken of Korg to write a set of drivers that would route audio from a soundcard to 'virtual' signal inputs. This would turn the Legacy Wavestation into a soft-A/D, which would be an altogether desirable upgrade. Before starting to use the Legacy Wavestation, you'll want to set up the Global settings for your configuration. This is where you determine which MIDI controllers will appear as the MIDI1 and MIDI2 modulators mentioned elsewhere in this review, and the input/output controllers that relate to the joystick. You can also filter various MIDI messages, and set the Master Tune and an overall transposition for the instrument. Importantly, this is where you determine whether wave sequences will run in synchronisation with a host application, with clock received over MIDI, or whether they're driven by the Wavestation's internal clock. The Global page is also where you can define up to 12 User Scales. This was a sadly under-used feature on the original, and no doubt will remain so within the Legacy Collection! 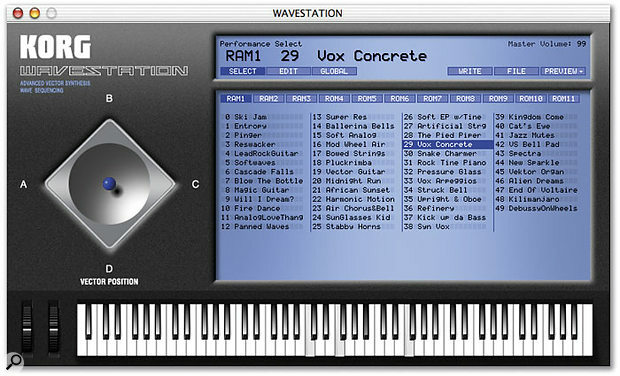 The original Wavestation offered 16 Multimode Setups, within each of which you could insert up to 16 Performances on separate MIDI channels. However, this did not mean that you had 32 effects units... you were still limited to just two. So, although you could decide which of the Performances in the 'Multiset' were routed to the effects (or not) and in what proportions, this was a far cry from having 16 Wavestations at your disposal. There was only one way to achieve this; you had to buy more Wavestations. You can see where I'm going, can't you? By turning the Wavestation into a plug-in, Korg have been able to dispense with the Multi mode because — if your computer's processor can handle the load — you can launch multiple instances of the software. However, by dispensing with all four 'Modes' of the originals (Omni, Multi, Poly and Mono), the Legacy Wavestation is less suitable for use with a MIDI guitar. This won't affect many users, but it's worth noting nonetheless. The Write button in the upper window of the plug-in is context-sensitive and, depending upon which page you are editing, allows you to write Performances, Patches and Wave Sequences into the Bank and location of your choice. Alongside this, the File button allows you to Save All and Load All as .fxb files, while the Import button allows you to load All Data, All Performances, Single Performances, All Patches, Single Patches, Wave Sequences and Micro Tune Scales created on the original hardware synths. Neatly done! More seriously, the Legacy Wavestation has lost SysEx. On the originals, you could transmit, receive, or transmit and receive every parameter change in real time. This meant that you could sequence changes in the voicing as you played, and replay these performances. With two Wavestations hooked together, you could adjust both at the same time from one of the machines. This was a powerful capability that the Legacy Wavestation seems to have lost — certainly, firing SysEx from one of my hardware Wavestations to another produced the expected results on the hardware, but nothing when the SysEx was redirected to the Legacy Wavestation. The loss of SysEx might have been ameliorated had the voicing parameters of the Legacy Wavestation been controllable from within your host application, but I can find no way to do this. If you have existing sequences containing real-time SysEx control messages, and you want to use these again, it seems that you cannot use the Legacy Wavestation to wholly replace your hardware synth(s). Another minor problem involves the rate of the internal clock within the Legacy Wavestation. My tests show that this runs at a slightly different rate to the clocks in the EX and A/D hardware. Given the very different hardware involved, this is not surprising, although it's worth noting that the two original synths remain in perfect sync over periods lasting many minutes. Happily, when the Wave Sequence Sync parameter in the Legacy Wavestation is set to 'On', the Legacy is synchronised to external MIDI Clock (well... provided that the Clock Master field in the Preferences is set correctly, that is — and this isn't mentioned in the Wavestation manual!). Having said that, if you change the MIDI Clock rate with a wave sequence running, the Legacy Wavestation and the originals lose sync with one another. Weird! Another curious bug appeared when I tried some Vector Synthesis using my hardware Wavestation EX as the control source. Rotating the joystick clockwise from the 'A' position, the response on the EX was A-B-C-D, as you would expect. On the Legacy Wavestation, it was A-D-C-B. I couldn't find a mis-set parameter that caused this, but it wasn't a problem... I just turned to the Global page and inverted the response of the Y-axis. Nonetheless, it seems to show that a couple of differences have crept in as the Wavestation code was rewritten for the Mac and PC. Finally, before concluding my list of concerns, I must mention the Legacy Wavestation 's hunger for power; it peaks at around 50 percent of the CPU power available on my 1GHz G4, as measured using the OS X Process Viewer. This limited me to a maximum of, umm... one instance of the Wavestation. I accept that this will become less of a concern as computer power follows its inexorable upward curve, but I'm a little concerned that one third of a software package consumes half the power of a reasonably specified, one-year-old Mac. Having noted the negatives, let's turn to the positives... My Wavestations are mainstays in almost everything that I record, not because I am limited in the number of sound sources at my disposal, but because they sound more appealing than almost anything else. Sure, they are not perfect: their screens can whine horribly, they can unexpectedly dump their memories, and they are susceptible to a bug transmitted on one of Korg's own voice cards, the only cure for which is re-initialisation. But despite their faults, their sounds are irreplaceable. Consequently, none of the previous pages will count for anything if the Legacy Wavestation loses the quality and character of the originals. Happily, it doesn't. In fact, as far as I could tell, it sounds identical. The only difference, as mentioned by Paul White last month, is that the original synths had a sample rate of 32kHz, whereas the Legacy Collection runs on my Mac at a minimum of 44.1kHz, making it a little brighter. We should not be surprised by the fact that the 'vintage' digital synths and their software recreation are identical, because Korg's programmers would have been able to rewrite the original Wavestation code for the G4 and Pentium processors. Nonetheless, I would like to complement them for resisting the urge to update and upgrade. Take, for example, the Wavestation's filter. While this appeared to be a conventional 24dB-per-octave digital low-pass filter, it was not, because it lacked resonance and substituted instead an 'exciter' that (Korg claimed) gave the sound greater clarity and definition. Some people used the lack of resonance as an excuse to criticise the Wavestations, and — to an extent — I have sympathy for this. What's more, the exciter was not what it seemed to be. While it added 'fizz' to many sounds, it was just as likely to reduce the impact of the top end as it was to enhance it. Nonetheless, I'm glad that Korg did not take the opportunity to upgrade the Legacy Wavestation 's filter. While the improvement might have been interesting, it would not have been true to the Wavestation. My final point concerns the usability and playability of the new version. Unlike, say, a Minimoog, for which the playing experience is as much a facet of the instrument as the sound, I've found that the Wavestation migrates into computer form without loss. In other words, the Legacy Wavestation plays and feels like a true Wavestation, with a hugely improved user interface. Who could resist that? Unlike other classic synths, which have spawned software descendents sporting hitherto non-existent oscillator sync, effects where none previously existed, and a host of other enhancements, the Legacy Wavestation is a triumph because it remains exactly what it was before; a Wavestation. Sure, it has one significant deficiency compared to the originals (the loss of SysEx) but the improvements in the user interface vastly outweigh this. Like other classic synths, the Wavestation still does what it does better than anything else. Performances: 11 Banks of 50 (three RAM Banks plus eight ROM Banks). Parts per Performance: Eight maximum. Waves per Patch: One, two or four. Patches per Bank: 35 maximum. Wave Sequences per Bank: 32. Steps per Wave Sequence: 255 maximum, 500 maximum per Bank. Total number of oscillators: 32. Like all Wavestations, it sounds superb. It makes Wavestation synthesis accessible... almost simple. Host CPU permitting (mine didn't! ), you can run multiple instances, for true multitimbral Wavestation-ism. Version 1.0.0 was totally crash-free during the review. Just one fifth of Legacy Collection, it's remarkable value for money. It has no signal inputs, either physical or in software. It doesn't appear to respond to SysEx — which means that it has lost real-time parameter control. It's not light on processor usage — my G4 could only run one instance. The Legacy Wavestation is, as far as I can determine, an exact sonic recreation of the original Wavestations, but one that offers true multitimbrality and a user interface that has improved beyond recognition. As just one fifth of the Legacy Collection, it's possibly worth the £399 asking price all on its lonesome.